Automotive manufacturers have been downsizing their engines to reduce the carbon footprint and also increase the efficiency. With uel prices being sky-rocketing, buyers prefer smaller engine for better mileage too. This has been seen even the luxury segment, as generally a lower displacement engine is the choice for the majority. To get competitive in this segment, Jaguar has now introduced the 2.0-litre petrol XF. 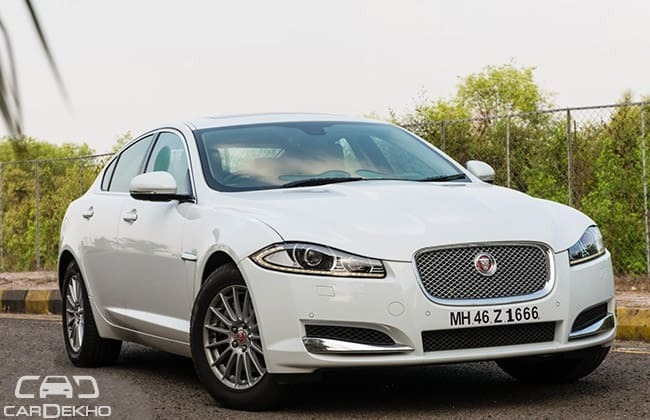 This is the first four-cylinder petrol Jaguar for the Indian market. Is it peppy enough? Find out as the mystery unfolds. The 2.0-litre doesn't get any cosmetic updates. It has the same XF front grille with chiselled headlamps. One could get confused between the XJ and XF from their headlamp design. The only change one sees is the growling cat logo is now red in colour. This does look good, but maybe on a body colour that is trendy than sophisticated. There is some similarity with the XJ, but it isn't the same, as the British brand doesn't want the same design for all its products. The silhouette is very coupe-like, which contributes to the glam factor. The XF now looks a bit more compact than competition, as everyone as all the German rivals have now stretched their new mid-size luxury sedans. Also, Ian Callum's XF design doesn't look aged at any point of time, it rather looks the more classy and subtle. At any point of time, the XF is still a bigger head-turner than any other in competition. The rear too with the chrome strip has its elegance. There is no badging, like the V6 diesel gets the S at the rear. The XF 2.0-litre being a four-cylinder still gets a dual exhaust. The interior of the XF is very much like a modern British palace. It has leather on the instrument panel and classy wooden finish too. Not all luxury car manufacturers add leather on the dash. Some might find it dull, but the motoring theatre continues to impress everyone. There is a touch screen that makes it easier to operate, than to get used to the multimedia systems of the German cars. The front seats are large and supportive. These are good for long journeys and have a good thigh support too. The rear feels short on head-room, due to the sloping roof. Other than that it is spacious and comfortable and the rear passenger can adjust the front seats from the back. This feature is only seen on the Audi A6, and no other competition offers this. The knee room at the rear isn't a problem, and like the other luxury sedans, this is a strictly four-seater. Even the boot is large and good enough to gobble luggage for four. The new 2.0-litre turbo petrol in the XF produces 238bhp and 340Nm of torque. This motor comes mated to an eight-speed ZF transmission. The power output is the best when compared to competing 2.0-litre petrol sedans. The closest anything that comes is the Audi A6 with a 2.0-litre 211bhp. The engine refinement is great and the NVH levels are low just like any other modern day petrol engines. The power delivery too is linear on the XF. Push the start button and the gear knob rises into your palm. The ZF transmission just like the 2.2 diesel shifts smoothly. Put your foot down, and the gear does take a while to downshift. Sometimes even the shifts are a bit jerky. The response time is better in the Sport mode. The insulation of the cabin doesn't make you feel speed. The XF is quick enough for city and highway driving. The eight-speed box ensures better fuel efficiency, as the engine spins at about 2000rpm while achieving speed of 100-120km/hr. This is faster than the 2.2-litre diesel, but doesn't match the pace of the 3.0-litre V6. The engine is torquey and the eight speeds of the box make it efficient too. We have driven this engine on the Evoque as well. The ride of the XF is sublime as the tyres on this variant are 17-inch than the 18 that come on the 3.0-litre. This helps to reduce the stiffness. The driving dynamics of the 2.0-litre XF hasn't changed much; in fact it has been enhanced. The ride suppleness on the XF S is good, but that on the 2.2 is excellent. The XF petrol is a tad cheaper than the 2.2 diesel, but for those who need a petrol this fits in much better than the old 5.0-litre with better efficiency. If you need better performance pick the 3.0-litre V6. If that's inadequate there is always the R spec model. What the XF gives you is a sophisticated styling and not a common brand name and still enjoys the same recognition like other German brands.